I seem to recall that Steve Wozniak chained a number of apple computers (model ?) together to calculate Pi. While attempting to track that article down, I came across this jerkwerks article. I find it very informative and well written. I would also like to tell the author that I also have a working Apple II, double drives, and original monitor, and with several extra boards for various purposes. I had to buy a new power supply in the 1990’s. A soon to be available replacement CPU board for the original HP 41c will run at 50X turbo speed. That would cut the 5 hour machine language program down to a bit over 6 minutes, beating the Apple II time of 24 minutes. Running the user code program at 50X would be a bit over 10 minutes. When you get your 50X turbo results let me know. I can send you the barcode or bin, lif, dat, raw, etc… of the RPN program and then you can test for me. The replacement board does not have a clock so you’ll need that to. For some reason on the 41CX if you have the printer connected it will run a bit slower, so run without the printer, then after the program completes connect the printer and then GTO E to print out the results and the time. Yep, no problem. Will do. If using a CPU accelerator is fair game one could use an 8 MHz “Zip Chip” for the Apple II. This this a) 20 year old technology and b) should result in a speedup of 7 to 8 times regular CPU speed (slightly above 1 MHz on the Apple II). I knew Ron as a friend when he was working on the Pi programs. There is a story behind the story. While the article evaluates the math processes there is an aspect that is also important and that is utilizing the peculiarities of the machine to gain a speed advantage. Hi Richard. Yes, Ron’s program is genius and his ability to use very few registers was remarkable. 35x faster on my 2.13GHz MacBook Air. Interestingly, Glen Bredon’s assembly solution produces its result in 3:14. Just a quick note. 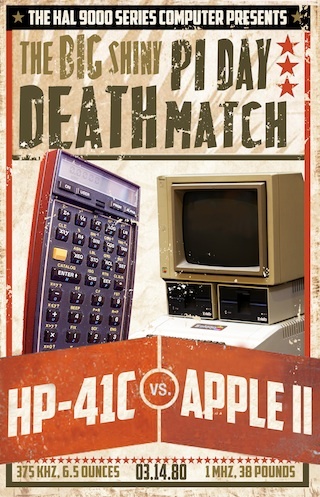 Although the old Apple II (not Plus, not e, not c, not gs) was VERY limited in some ways, with an inexpensive 8 bit 6502 processor with a limited instruction set and a 1 mHz cpu clock speed, its real strength was that it finally gave the public nerds inside access to a computing machine, largely because of Steve Wozniak’s contributions, a hacker at heart. And they took off and ran with it, helping to start Apple into becoming the company that it is today. 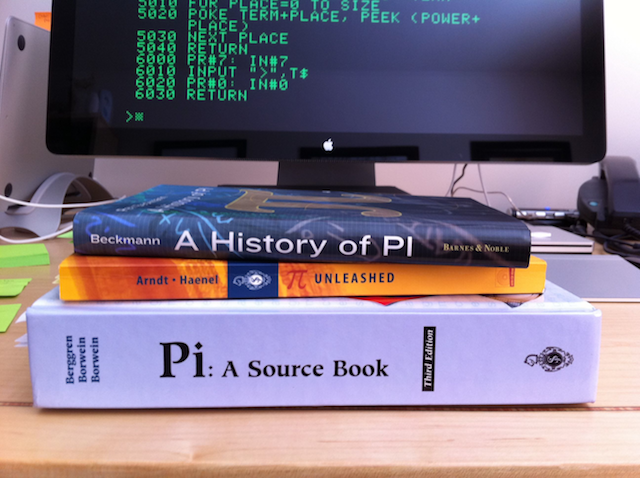 I, too, was intrigued by Bob Bishop’s _Micro_ magazine article on calculating Pi. 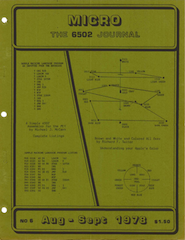 So much so that in 1980 I wrote a machine language program for my 48K Apple II that was able to calculate Pi to 36,364 digits in 52 hours, 28 minutes and 29 seconds. I was able to check the accuracy of my result by visiting the UCLA library and comparing the last few hundred digits in my result. I wrote it in machine code (no assembler), using Woz’s internal disassembler to check my work. I tried Gauss’ equation and Stirling’s equation, but I found Machin’s formula to be the fastest on my Apple II. I printed the result with a short AppleSoft program that ‘co-habitated’ memory with my machine code. A major issue in outputing 36,000+ on a 48K machine (minus room for the lower 2k+ used for the Applesoft program) is that you don’t have a lot of room for partial results as you complete the task, particularly when changing the binary to decimal for output. And the code was fully relocatable on this 8 bit processor. It was a fun challenge. Stomer’s Arc-tangent is a bit faster than Machin (http://sense.net/~egan/hpgcc/#Example:%20%20%CF%80%20Shootout). If you still got your code, I’d really like to see it. BTW, I am working on an article about the Apple II cassette tape. Hopefully I’ll be done in about a month. PS – Using your ‘square of the ratios of the digits’ method, I would guess that the program above would have calculated the value of Pi to 1000 digits in about 2 minutes and 23 seconds. I’m sure I did some timings for this in 1980, but I can’t find any record of it. So machine code was faster than integer basic, but we all knew that anyway. Yep. Now I really want to see your code. I you are interested, could be an opportunity….